Happy Peanut Butter and Jelly Day! I know it’s a little late in the day to give you the recipe, but now you’ll be all set for next year when National Peanut Butter and Jelly Day rolls around. Or maybe you could make these tonight? 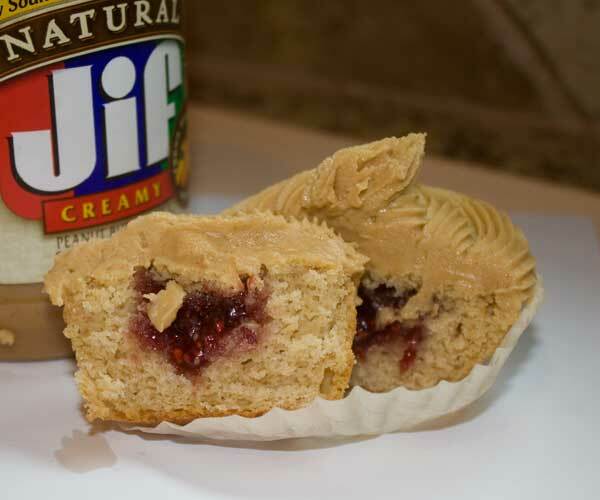 The ingredients for Peanut Butter and Jelly Cupcakes are things you probably have in the pantry. I filled my cupcakes with raspberry preserves, but I’ll bet they’d be really good with grape or strawberry. Or forget the jelly and go with chocolate chips! Updated: National Peanut Butter & Jelly Day is over, but after I made these I tried Martha Stewart’s recipe and Taste of Home’s as well. The TOH version was the best (less dry), so I’ve modified the cake part of this one a bit to make it more like that one one. I increased the vanilla, left out the cinnamon, used a mixture of granulated and brown sugar and increased the butter. Also used whole milk, but I’m sure reduced fat would be fine. Peanut butter cupcakes stuffed with jelly and frosted with a peanut butter flavored frosting. Preheat oven to 350 degrees F. Line 18-20 cupcake cups with paper liners. In a large mixing bowl, beat butter until creamy. Add peanut butter and both sugars and continue beating until light and fluffy. Beat in vanilla, then beat in eggs, one by one. Mix together the flour, baking powder, baking soda and salt. Add to the batter alternately with the milk. Divide batter evenly among the muffin/cupcake cups and bake on center rack for about 20 to 25 minutes or until cupcakes appear set. Let the cupcakes cool, then use a sharp knife to carve out a little hole. Fill it with jelly. Ice with Peanut Butter Cream Cheese Frosting. 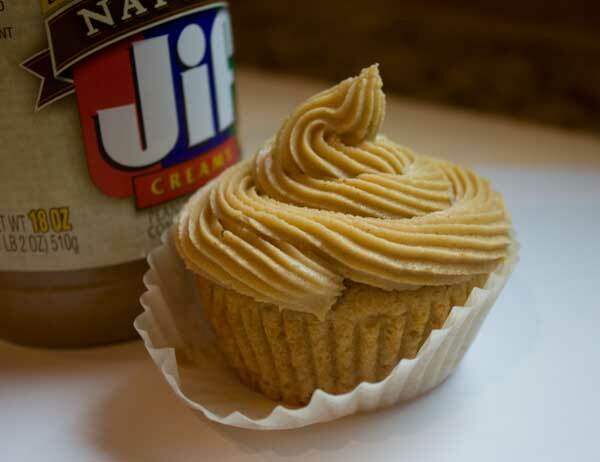 To make the frosting, beat together ½ cup peanut butter with ½ cup butter and 3 oz of softened cream cheese. Gradually stir in 2 cups of powdered sugar 1 teaspoon of vanilla extract and 2-3 tablespoons of milk Beat until light and fluffy. Taste to make sure it has enough peanut butter flavor, and if not, stir in some more. I had no idea there was a PBJ day! Yummy looking cupcakes. I would have to go with the chocolate chips.